Sega has finally brought one of the popular Japanese rhythm Hatsune Miku: Project DIVA games to western shores. 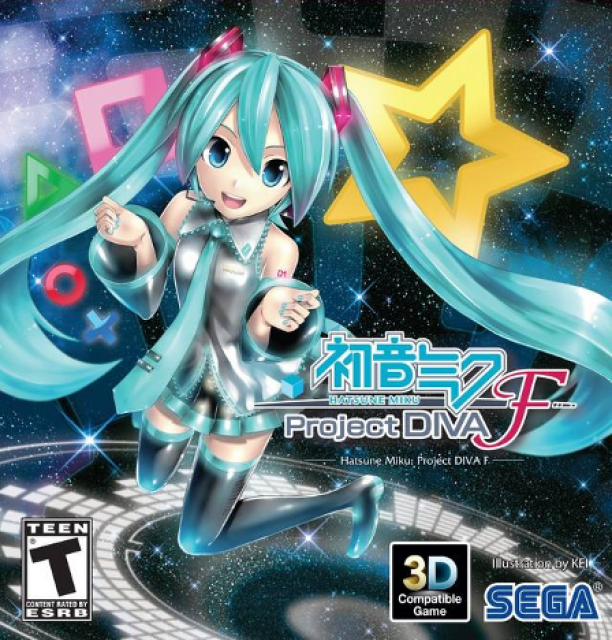 Hatsune Miku: Project DIVA F is a port of the Vita game. Having imported and played the previous three titles for the PSP, I was really excited when Sega announced they would be localizing this title for release here in the West. I had always wanted to check out the Edit Mode featured in these games, but, with the language barrier, I was unable to. Now I could. 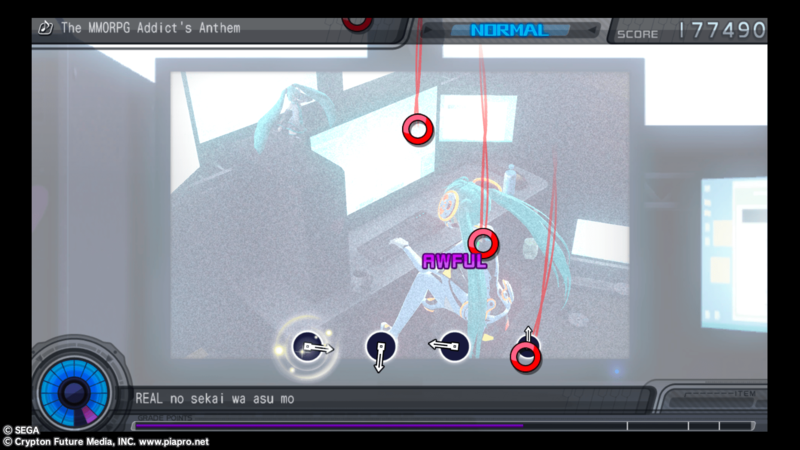 I previously reviewed Hatsune Miku: Project DIVA 2nd for the PSP. The basic gameplay hasn’t changed from the previous game. Targets still flow across the screen, and you will hit the corresponding buttons to play the notes in time with the song. There are new features thrown into the mix this time around that really added to the gameplay. The game features a few tutorials to get you started, so, if you are new to series, I recommend you take the time to check them out. While, sometimes, a game tutorial is not necessary, in this game it is. With so much going on, you could get a little lost without it. One of the new gameplay features is the addition of star notes. On the Vita version, you would simply tap the screen in order to hit these notes. This effect is simulated on the PS3 by using either of the analog sticks, as they can be tapped in any direction to hit the notes. They have also added Technical Zones to each songs. Each song usually has two of these zones. If you hit all the notes in these sections with a “Good” rating or better, you will receive bonus points. These points will help your grade gauge at the bottom of the screen fill up faster. This will go a long way towards helping you complete a song with a better ranking at the end, or to squeak by on a really difficult song. Chance Time has been reworked a bit, as well. You will notice that when it starts, a star will appear in the bottom left corner of the screen, and, as you hit the notes in those sections, the star will fill up. The better rating you get on the notes you hit in this section, the faster the star will fill up. You want to fill up the star completely before Chance Time is over. If you do so, a star note will appear at the very end of the section. You will get a huge boost in grade gauge for hitting this star, and be treated to a slightly different version of the music video, as well. The new gameplay features spice up the formula a bit. I really like the way Chance Time is done in this version of the game as compared to previous games. The star notes can seem a bit out of place in certain songs because you can just flick the analog stick like mad and hit every note in the section with ease. In other songs, where they mix the star notes in with the normal notes, this seems to make things flow a bit better. Even with the star notes sometimes feeling out of place overall, this still is one of the best-playing games in the genre. The graphics are upscaled from the Vita version of the game. Some would say they look a bit dated. Me personally, I think they look great. I’ve seen these Divas on my tiny PSP screen for years, seeing them now on my HDTV is a really nice change. The Divas all look great in their costumes, and each is very detailed. There is no screen tearing or any kind of graphical problems with the game. All the animations are silky smooth, and there are some of the most impressive music videos in the game to date. The videos shown during the songs are all immensely different and offer a unique experience. One video even features a full anime scene going on in the background. The music is absolutely fantastic, and this might be best collection of songs in this series to date. With songs such as “Tell Your World,” “Black Rock Shooter,” and “The MMORPG Addict’s Anthem.” There are 38 tracks included, these include the DLC tracks from the Vita version of the game. There are so many good tracks in this game that to tell which ones I really loved I would have to list the entire set. Tracks vary from slower ballad type tracks to some faster guitar rocking ones. There is a great mix of musical styles to fit anyone’s taste. The customization options for your performers is simply staggering. There are tons of Modules (outfits) and accessories to unlock for each diva. Some accessories are cat ears and a halo. You can also add back accessories like angel wings and backpacks. This will give you lots of options when you dig into Edit Mode, as well, which we will get to that in a minute. You will purchase these from the in-game Diva Shop. As you complete songs you, will be rewarded diva points with which to purchase these items. Just like in the previous games, you will have to complete tasks before some modules become available. The Diva room section has had some major upgrades this time around. It still works basically the same way as in the previous game, where you will give the diva gifts to improve their affection towards you. This time around, though, you will get event scenes when you present them certain items or place certain items in their room. Some of these scenes are quite entertaining. For instance, giving Miku a paper fan will cause a scene in which Rin comes in and tries to eat a piece of taiyaki which she has left on the table. Unfortunately for Rin, Miku has that paper fan you just gave her and smacks her around a bit with it. There are lots these events to found here. Another really neat thing I found was on Miku’s birthday, as soon as I went in the diva room section, two of the other Divas brought her a birthday cake, and an event took place. So, the game keeps track of the date, and certain days will trigger events. There is also a communication mode, in which you can touch the Diva’s head. I know this sounds really strange, and I am sure this was put in the Vita game to have another touch feature in the game. You basically rub the Diva in the right way and you will build their affection for you. If you do this correctly, they will ask you to play a game of “made you look” with them. Win or lose, this will build up affection, as well. I can finally talk about Edit Mode! In my last review, Edit Mode was out of my reach because of all the kanji in the import. Thanks to Sega localizing this one, we can enjoy the benefits of this mode now. In this mode, you can make your own videos. You can pick the stage, characters, props, camera positions, movement and much more. You can even place the markers for the rhythm game in these videos, so you could basically make an entire new game with this if you wanted. You can use any .mp3 file you have on your PS3 system, or any of the in games tracks. Once you are done making your edited videos, you can upload them to PlayStation Network and share them with just your friends or with everyone. The only drawback to this is if you used an .mp3 from your system, it will not upload that data, so you will have to have a .mp3 on your system to match up with the video data. The amount of options in the mode is simply staggering. It looks really complicated at first, but the game provides a ton of in game tutorials to help. They are very detailed and will get your started nicely on your road to making a killer edit. The following video is from a YouTube user, and shows off some of things you can do in Edit Mode. This game, like the previous ones, is one of the best rhythm games around. The solid gameplay, wonderful music and ton of extras make it a great value for the $50 price tag. The fact that they have four different difficulty levels means that just about anyone can jump in and have fun. It is great to start out on easy with few notes and work your way up extreme where it is pure chaos. 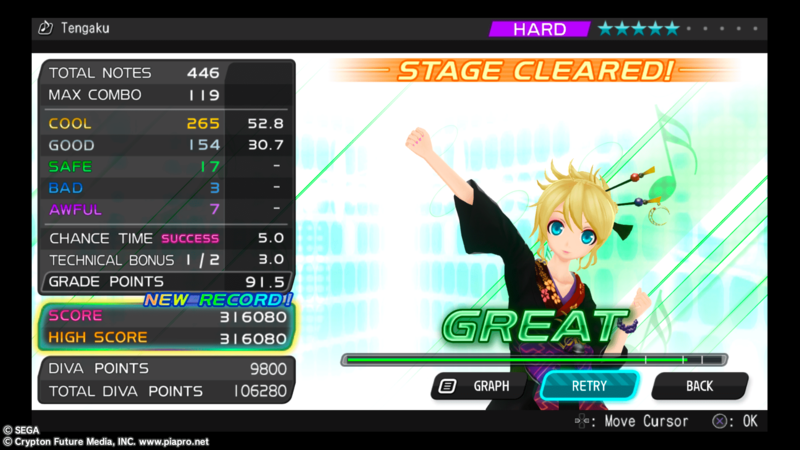 I find it exciting any time I can complete a song on a harder difficulty level. It took me about 20 hours to complete all the tracks on normal and hard. This may take you longer starting out, but you will want to challenge these songs for better scores time and time again. I have not had this much fun playing a game in a long time, as the gameplay is completely addictive. The only real problem I found with this is that Sega only translated the song lyrics to Romaji instead of English. I would have like to have seen the lyrics in full English, so, hopefully, they will release a patch or something to fix this later on. That does not take away from the fact this is one of the best rhythm games you will ever find. If you are fan of this genre, you owe it to yourself to buy a copy as soon as possible. Review copy was purchased by the reviewer.